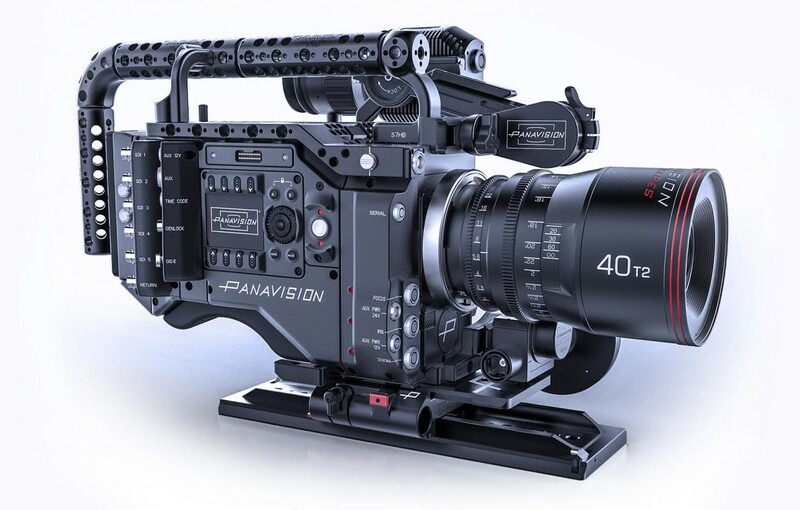 Introduced earlier this year at Cine Gear, the Millennium DXL Camera (DXL), is what you get when Panavision, Light Iron and RED Digital Cinema join together to make a baby. 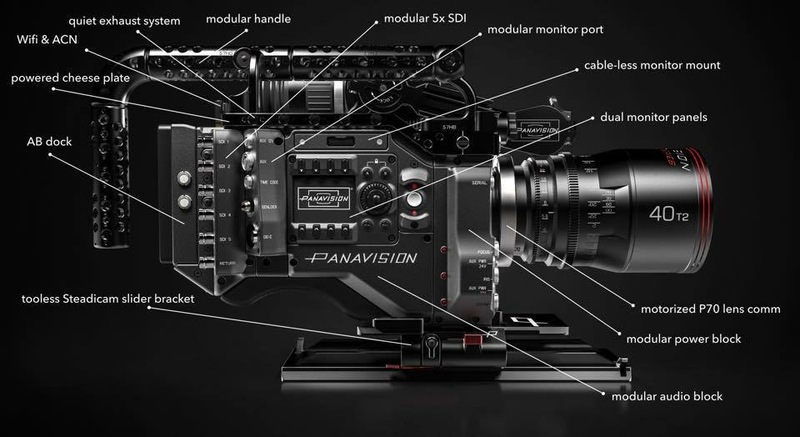 Albeit a very shiny and very expensive camera-baby, boasting a modular design, an 8K sensor, large format optics, and an optimised workflow. At the beating heart of the DXL is the new 16-bit RED Dragon 8K Vista Vision/Full-Frame 35.5-megapixel CMOS sensor. Featuring 15-stops of Dynamic Range and variable framerate of up to 60-fps at Full-Frame 8K (8192 x 4320) or 75-fps at 8K 2.4:1 (8192 x 3456). It’s the same sensor from RED’s brand new Weapon 8K VV camera, which was released late last year. The DXL’s 8K sensor has a full-frame size of 46.31-mm (or 40.96 x 21.60-mm) – making its sensor size a lot larger than the open-gate of the 6K RED Dragon (34.5-mm), the S35 4K Sony F55 (27.5-mm) or the ARRI Alexa XT (33.5-mm). 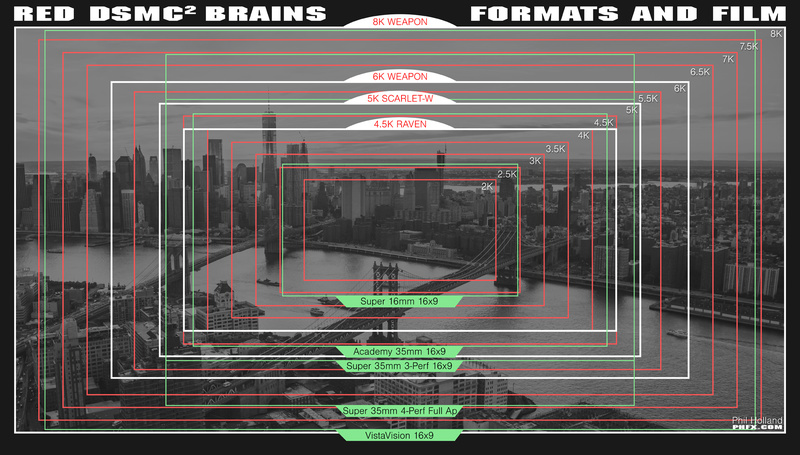 A handy diagram by Phil Holland showing the different format sizes (image: from reduser.net). The camera’s body has a mid-sized form-factor weighing in at 10lbs (4.5kgs), with dual menus on either side (one for the DP and one for camera assist) and a streamlined airflow system that is said to dissipate heat quietly. 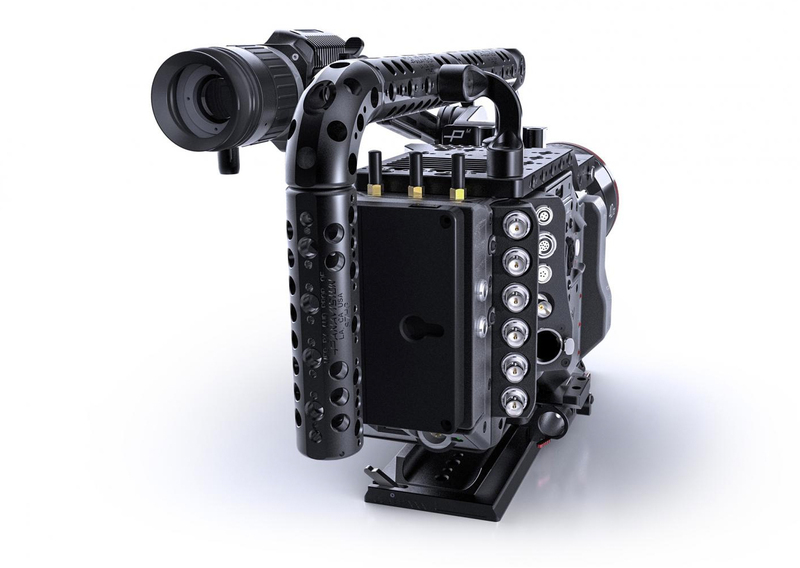 It features 6 independent video outputs and has built-in modular accessories to allow for toolless changeovers during production, along with a custom ‘cheeseplate’ with integrated electronics. Another feature worth mentioning here is that the DXL allows you to simultaneously record both 4K proxy files (in ProRes or DNx) and 8K RAW footage to SSD – giving users a direct-to-NLE editing workflow. Michael Cioni, DXL Product Director and President of Light Iron, said: “Using efficient SSD media, the cost of capturing 8K files with DXL is more economical than using third-party recorders on lower resolution cameras. 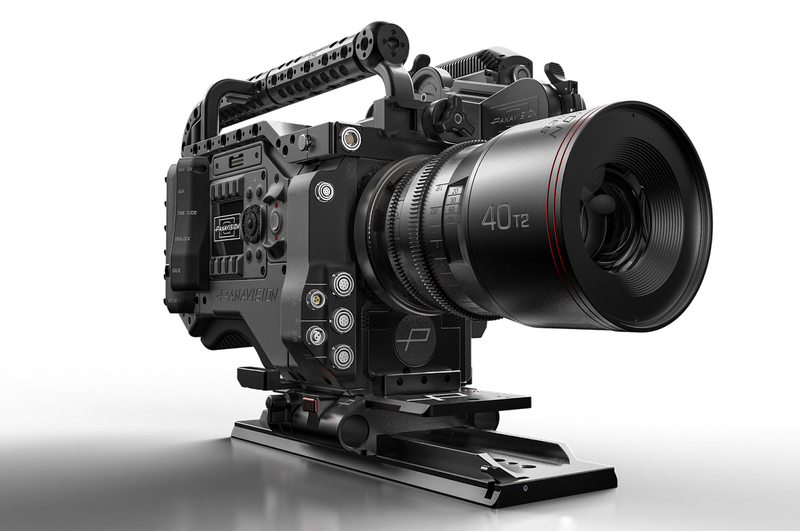 It also has a built-in wireless timecode for genlock (ACN) and a built-in wireless lens control system, allowing users to directly motorise the company’s new large-format Primo 70 lenses. Another standout feature of the camera is its proprietary image mapping process called ‘Light Iron Color’, which works with the CMOS sensor to create a ‘cinematic look’ in-camera and seamless integration with the above-mentioned lenses. The DXL can also support up to 6 independent 1D LUTs or up to 4 independent 3D LUTs – not too shabby, indeed. “What is exciting, is that cinematographers will notice how 8K acquisition creates images that are smoother, not sharper,” Cioni added. 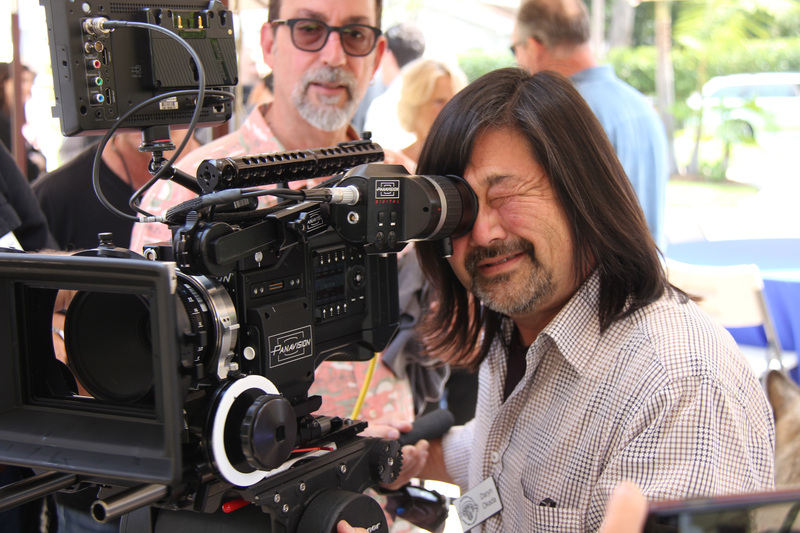 ASC members Daryn Okada (at eyepiece) and James L. Carter examine a Panavision DXL at the ASC Clubhouse (image: ©ASC 2016). 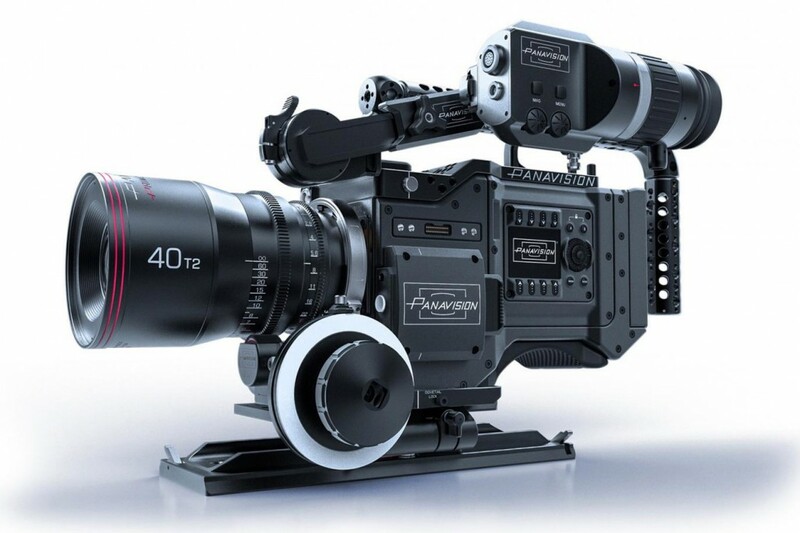 The Millennium DXL will be rented exclusively through Panavision and is expected to be available in Q1 of 2017.